Why Bulldog Hates Gaben So Much ? Chapter 1: Good Ole Days. It wasn't always hate from the former Tea Eye winner, as just like the good days back in TI3, Valve has delivered what the community love. From cool battle passes to Diretide and free skins, everyone wished they were playing Dota way back in 2011. Even pro players and literally everyone involved in the pro scene loved Valve as much as us in the community. However, like all things, nothing last forever. Valve really made most of the community pissed off about their statement last year. Now the decision made by Valve was controversial as everyone has their own opinion on whether if Valve’s decision was right. So what Valve did was, after a series of drama involving Kuku and TNC being banned from China, more specifically Chongqing, Valve decided to put an end to the whole drama by dropping the ban on Kuku from attending the Chongqing major and also impose a penalty on TNC as an organization who failed to handle things professionally. There are definitely two or more perspectives on this. One being that TNC deserved the punishment for dragging the drama and fueling it through the community’s support. 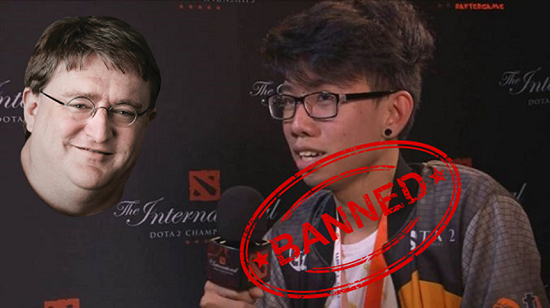 While on the other hand, others feel that the ban by Valve was undeserving for Kuku and they feel that the spirit of openness in eSports has been breached after that announcement. Either way, everyone moved on as at the end of the day, Valve’s judgement is final and the whole community has waited for them since forever about their actions on the case. So, this announcement pissed AdmiralBulldog off very much, as he feels that the decision by Valve (or Gaben for the memes) was against freedom of speech. While in another stream, Bulldog did address the matter about the difference between real hate speech and racism without context. But this time around, Bulldog is angry again about a different matter. Recently, Bulldog has voiced out about the horrible matchmaking experience he’s having. Where, he stated that immortal rank 100 players don’t want to be playing with rank 2000 or vice versa. The skill gap between the two is so big that it’s frustrating to play. Right after, he ends his tweet by dissing about when did Valve became this lazy sh!t company who does nothing to improve the quality of life for their players. If that doesn’t hit you hard enough, you probably aren’t a Valve employee. 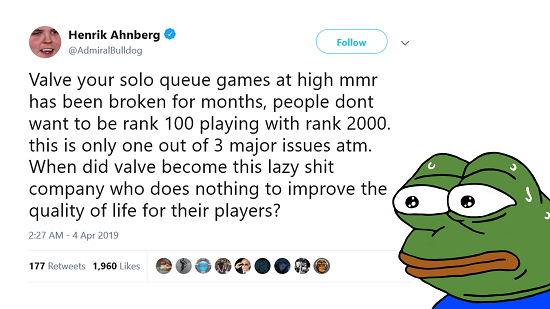 Anyways, the tweet raised many concerns among other users, some hitting on Bulldog about him preferring 1-hour queue time instead. But many other pro players seem to be on Bulldog’s side on this. Let’s be honest here, this doesn’t just happen in immortal games. Even in Divine games, you can often get a Legend 5 on your team during non-peak hours. Now, it seems like Bulldog continues to prove his point each time he streams or play Dota. Where he points out the imbalance in Dota matchmaking. Like how he often gets one top 200 player on his team with another 3 top 1000 player or even divine players. Meanwhile the enemy team is more balanced but doesn’t have a single top 500 player. This is also another issue of matchmaking that Bulldog has been ranting about. Chapter 5: Bulldog at TI9. 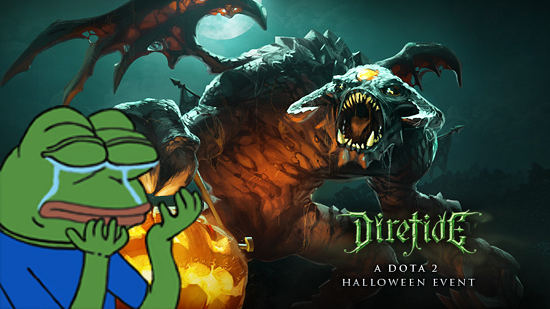 With all these public ranting on Valve and also not agreeing with the Kuku ban, many are worried that we might not see Bulldog in yet another TI. This time not about visa issues. However, we definitely hope that Bulldog actually gets to TI9 after so many years. 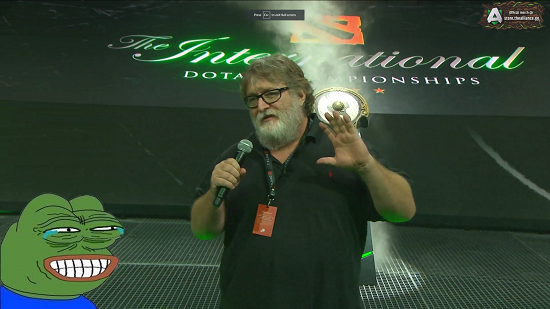 Or else Gabe will be making another joke about Bulldog in TI9 just like last year (check link below). I would also like to thank the readers who always check out my articles, my articles took all 6 featured slots on the site, so I’m really grateful about it. Enjoy some Gaben meme below and stay tuned. 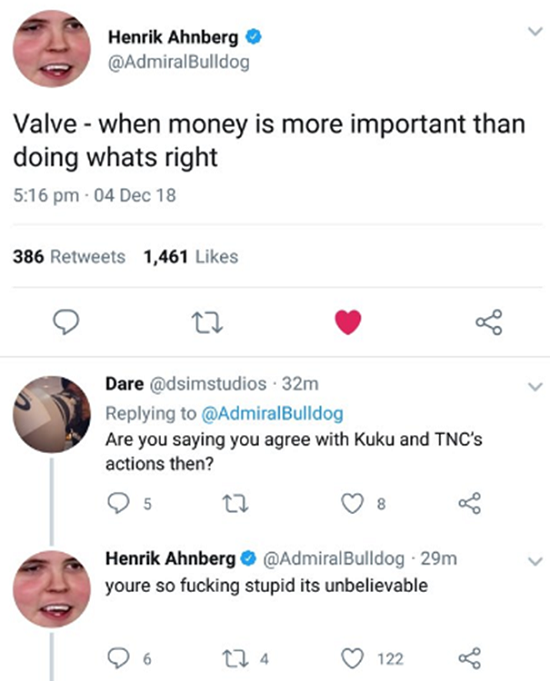 AdmiralBulldog gets Serious on Valve’s Decision and Kuku Drama.